Problem: When updating macOS to High Sierra (version 10.13), you are offered by default to save the Documents and Desktop folders in the iCloud. As your Lodgit database is no longer located locally on your Mac's hard drive, working with Lodgit Desk can become very slow - especially if your Internet connection is slow. 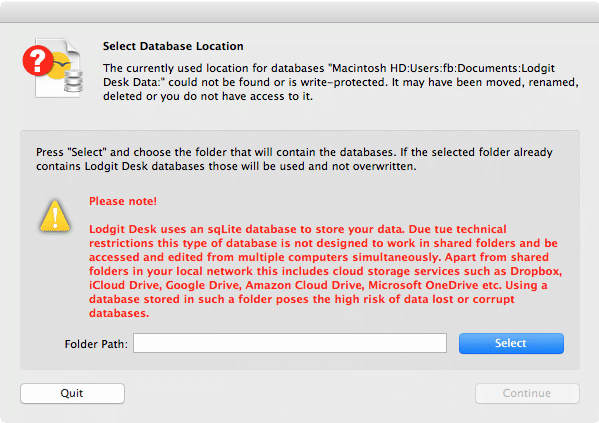 There is also a risk that the synchronization process will access the database while Lodgit Desk is trying to write, thereby corrupting the database. Please note: As of Lodgit Desk version 2.1.4, the folder "Lodgit Desk Data" is created by default under >User >Lodgit Desk Data during a new installation. Open your Documents folder in the Finder (Finder: Go > Documents). Open a second Finder window and go to your Home folder. (Finder: File > New Window; Go > Home. Move the Folder "Lodgit Desk Data" from your Documents folder to your Home folder. Click the button Select and select the "Lodgit Desk Data" folder in your Home folder. Click Continue. Lodgit Desk opens as before.